It seems as though I am the only lady from all worn out that is still in the city. While the rest of the ladies are off traversing the globe, I'll be here in Chi-boogy holdin' down the fort. This is our first installment of "Cheap Monday" highlighting the great deals we come across. 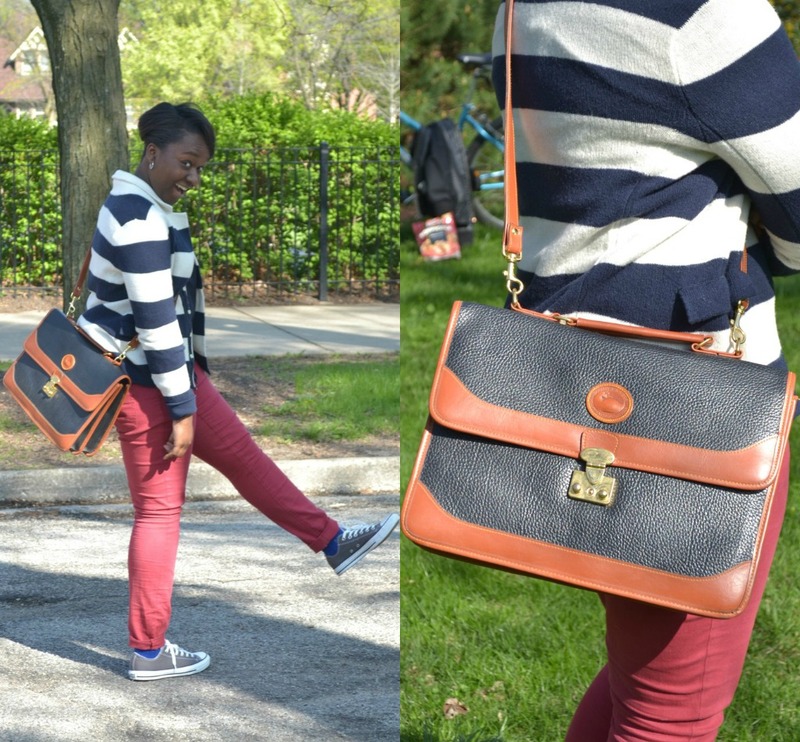 And here is the story of the Dooney & Bourke briefcase-ish bag I picked up this past weekend. I had just devoured some Guatemalan food up in Roscoe Village at El Tinajon, so I was fueled up and ready to go deal hunting. I headed across the street to Village. I looked around at the clothes, and didn't find anything too exciting. Then my mom told me that she had seen a brand new pair of loafers from Talbots, and I figured I should scrounge around a little longer to see if I could find anything good. Speaking of brand new shoes...check out those fresh, new kicks. I haven't worn a clean pair of All Stars in quite a long time, but I was recently inspired by Katherine Lowe, the stylish mind behind Katherine is Awesome. And then I saw it. Hanging behind the counter. It was love at first sight. I knew I would regret not buying this bag, so I took the next step and asked the man to get it down for me. It was in fantastic condition. Inside lining perfectly intact, outside a bit dusty, but nothing a dry rag couldn't take care of. The tag said "2950" in that infamous Village scrawl that lacks a decimal and dollar sign. Thanks to the upcoming holiday (Easter), there was half off sale. That really sealed the deal. Moral of the story, I now own the best bag in the my world.